Thermal coagulation is an alternative ablative technique to treat CIN lesions. 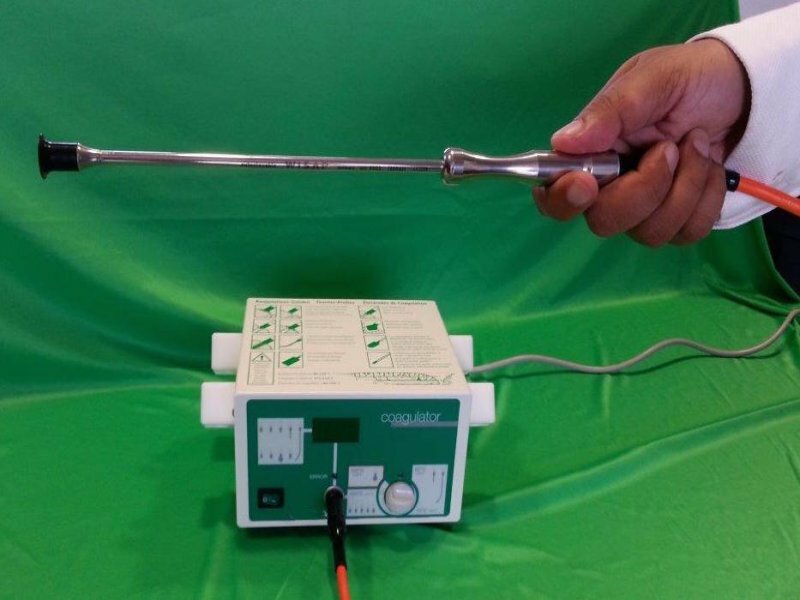 Traditionally, the technique is known as “cold” coagulation, because the temperature used (100 °C) is lower than that used for electrocautery. The equipment is called the Semm coagulator, to honour the inventor of the technique. Thermal coagulation uses a probe heated to 100–110 °C for 20–45 seconds to boil the intracellular water and destroy the normal and abnormal cells of the transformation zone. Multiple applications of the probe are feasible with thermal coagulation. Hence, unlike cryotherapy, the technique is not limited by the disparity between the size of the lesion and that of the probe. The rest of the principles and indications for treatment by thermal coagulation are the same as those for cryotherapy. Thermal coagulation, although it has not been evaluated as widely as cryotherapy, is as effective as cryotherapy in treating all grades of CIN lesion.